chili is not a pretty food. i’ve been trying to take more “action” shots and i just couldn’t do it with chili. it looks like dog food. thankfully, it doesn’t taste like kibbles and bits and it’s perfect on a wintry day. it’s also perfect with cheese fries. 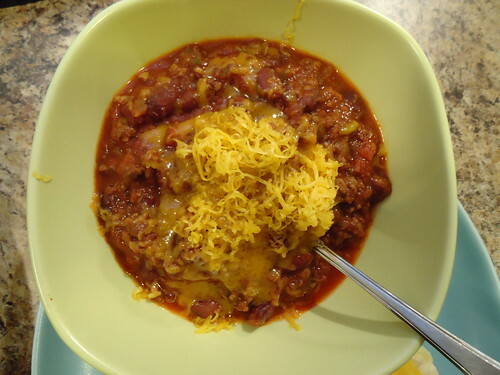 read on to get the recipe for chili perfection. in a large skillet, brown ground beef with chopped onion. put the beef, onions, beans, tomatoes, pepper, garlic and seasonings in a crock pot. sorry, no clues on the secret ingredient. 🙂 stir well. about an hour before serving, combine tomato paste, water, chili powder and cumin in a small bowl. add to chili and allow to cook on low for an additional hour. after you’ve enjoyed it for the first time, you may enjoy it reheated in your lunch. or you may enjoy it reheated over chili cheese fries. while your fries are baking, melt butter in a large non-stick pan over medium-low heat. whisk in flour, continue whisking for 1 min. 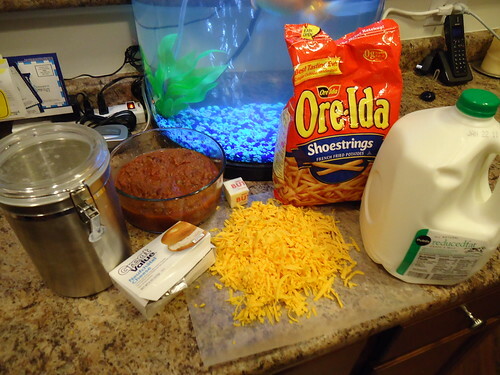 pour in milk, beer, seasonings. whisk until bubbly, or until the mixture sticks to the backside of a spoon. whisk cream cheese and 2 c shredded cheese into pan making a figure-8 pattern. turn heat to low and continue to whisk until cream cheese is melted. 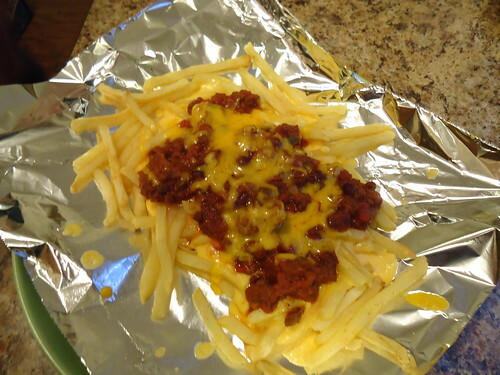 pour cheese over fries, cover with pre-heated chili, and top with remaining cheese. place under broiler on high for 1-2 min. or until cheese is bubbling.